You wouldn’t normally think that skincare and gut health would have anything to do with each other. However, there’s actually quite a close connection between the two. The connection is referred to as the “gut-skin axis”. If the gut is inflamed, it can actually cause inflammation in the brain and also in the skin. This skin inflammation can be seen as acne, dermatitis, eczema, psoriasis, or many other skin conditions. So just as probiotics can help alleviate digestive disorders and depression by reducing inflammation, it does the same for skin conditions in a similar fashion. Studies show that taking probiotic supplements and/or probiotic foods may help reduce acne. In addition, research is now showing that applying probiotics topically can improve skin and reduce acne. Our skin naturally has beneficial flora that shield the skin against harmful pathogens and also helps regulate inflammation. Unfortunately, we can disrupt these healthy bacteria with things such as harsh soaps, over-exfoliating, and environmental toxins. Replenishing the good bacteria through consuming and applying probiotic supplements and probiotic foods seems to reduce skin inflammation and improve acne. 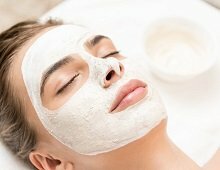 Many products containing probiotics are hitting the market such as moisturizers, makeup, masks, facial cleansers, and resurfacing treatments. Okay, I know it may sound a little weird to put food on your face but just trust me on this one! Not only does yogurt have beneficial bacteria, it also has lactic acid (a natural hydroxyl acid) and zinc, which both benefit the skin. Yogurt also has healthy fats that nourish the skin. Rumor has it that Cleopatra achieved and maintained her beautiful, healthy skin by frequently bathing in fermented mares’ milk. So this idea could’ve potentially been around for ages! In a small bowl, mix together the yogurt and any other optional ingredients you are using (such as olive oil or turmeric). Gently apply the mixture onto your face in small circulation motions. Leave the mask on for 10 to 30 minutes. Leaving it on for 10 minutes will be more moisturizing and 30 minutes will be more deep cleansing. Wash off the yogurt mask with warm water and gently pat dry. You can make and apply this mask every week or so for healthy skin and reducing acne. If you’re looking for a natural way to clear your skin and get rid of acne, try using the probiotic mask with yogurt. It’s simple to make and may lead to some great skin benefits! Also, don’t forget to take your probiotic supplements for additional health benefits. If you need help finding the perfect probiotic, check out our list of the 10 best probiotic supplements!